Moonlight is a cleverly-conceived, beautifully-executed, complex and unexpected film. It follows Chiron – a black kid growing up in Miami, during the 1980s – through three key and very distinct phases of his life: from young boy, through teenage years, to manhood. Set against a powerful musical soundscape and at-times-captivating landscape, a subtle metaphorical language helps connect the three periods and Chiron’s relationships. An outsider, who is routinely bullied for being awkward and different, with a junkie mother and an absent father, Chiron spends most of his life trying to just disappear. Guidance and some respite from life comes in the unlikely form of the local drug dealer, Juan (played in a wonderfully understated way by Mahershala Ali) who relates to his background and takes him under his wing. He tries to teach Chiron the importance of finding and being true to yourself, in your own time. But Chiron is swept away by the current of his life, constantly scared of drowning and barely able to catch his breath for long enough to be able to take stock and make a considered decision about the direction he actually wants to swim in. Despite some extreme violence, Moonlight is a surprisingly sensitive and insightful film. It looks at the impact of addiction, in an unexpected way, whilst also boldly addressing the stigma surrounding homosexuality – a seriously under-addressed issue in black films. Touching. Poignant. Beautiful. Violent. Heartbreaking. Throughout most of the film, you just want to crawl into the screen and hug Chiron, to make it all better. Although, there was one particular part at which I wanted to stand up and applaud him. Though difficult to watch at times, this is a must-see film, with brilliantly-measured performances from all three Chirons – Alex R Hibbert, who plays Chiron as a child; Ashton Sanders, who plays Chiron as a teenager; and Trevante Rhodes, who plays Chiron as a young man – as well as Chiron’s friend, Kevin, played by Jaden Piner (the child), Jharell Jerome (the teenager) and André Holland (the young adult). Special mention must also go to Janelle Monáe, as Juan’s girlfriend, Teresa, and Naomie Harris, as Chiron’s mum, Paula. 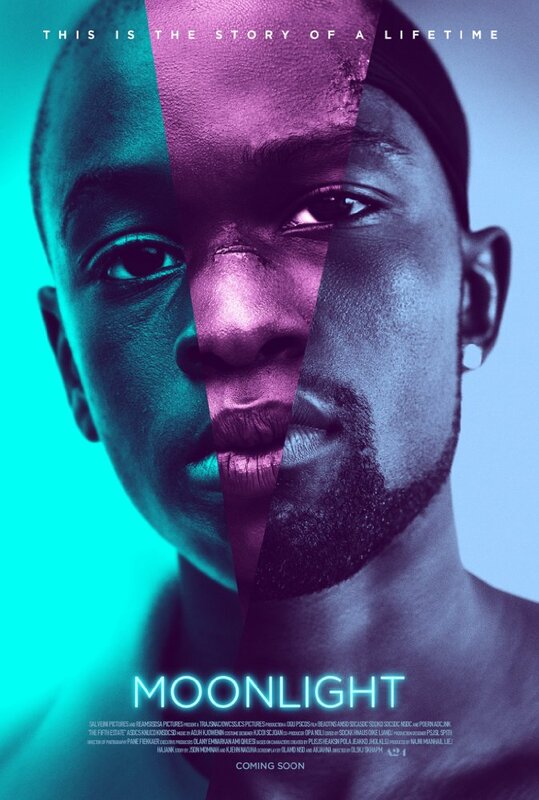 Directed by Barry Jenkins, who also co-wrote it with Tarell McCraney, with cinematography that moves you effortlessly between intimate or more dream-like states, to urgency or violence, Moonlight will have you gripped throughout and become one of your standout movies of the year. This entry was posted in Film, London Life, Review and tagged 1980s, Alex R Hibbert, Ashton Sanders, Barry Jenkins, BFI, gay, homosexual, homosexuality, Janelle Monáe, LFF, London Film Festival, Mahershala Ali, Miami, Naomie Harris, Tarell McCraney, Trevante Rhodes. Bookmark the permalink.